I'm afraid my computer is where all recipe swaps, chain letters and other "pass it on" things die a slow miserable death, because despite all my good intentions, I tend to file them away to do later and then forget! 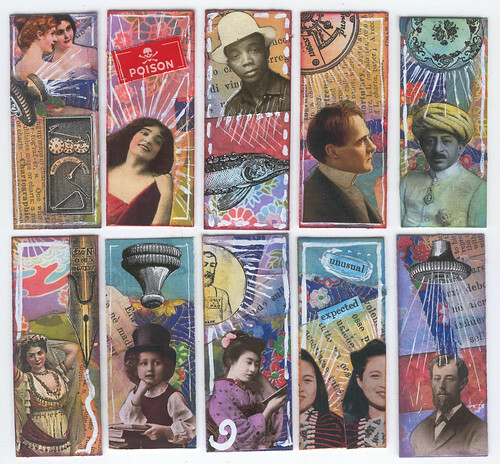 I finally got to meet Dana Driscoll aka Adriayna in person on the aforementioned Indiana trip last August, having previously traded art with her through ATCs For All (and its predecessor Site Which Shall Not Be Named ;o) She also has created an amazing Tarot deck. Oh, yeah, and she was doing all this while earning a PhD and serving as an (unpaid) administrator for AFA and its sister sites! KatieV aka Mixing Katie drove all the way from Bloomington to Zionsville IN to meet up for a live ATC trade on that same trip. 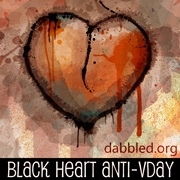 I've also met AFA members VBR, Gingersnap, inkadinkadoo, crazycat, and Vicki Z, but they aren't blogging that I know of. So go join AFA, if you're not already a member, and leave nice comments in their galleries! 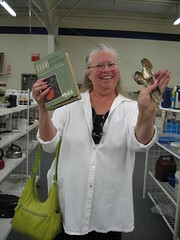 I met Cheryl aka Muppin at the International Quilt Festival in Chicago in 2007, and we traded ATCs (of course). After trading on-line several times, I met Katxena in person when I was visiting my folks in Virginia last year. 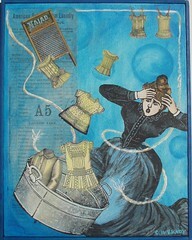 She currently has an artistic blog challenge that both intrigues and daunts me. 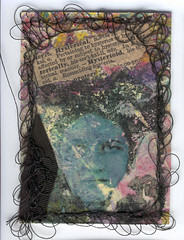 And while I have yet to meet her in person, I've talked on the phone with Diane of Altered Book Studio when she very kindly took time to share her expertise on teaching a beeswax collage class. So go check out their artwork and leave nice comments for them because they deserve it! So I was printing new business cards to take to a networking meeting on Wednesday and thought I should make some serendipity collage Moo, but then got carried away and started adding small images from the Ten Two Studios little collage sheets, plus Dover clip art scraps, and a bit of doodling with white out and gel pens. Didn't actually get them done in time to take them to the networking meeting! First I decided I didn't want my envelope decoration to be too busy, since this would distract from the ATCs, so I just painted them basic black. 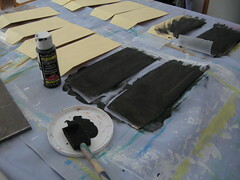 I considered priming the envelopes with gesso but was too lazy, and they turned out fine without it. I slid pieces of wax paper inside the envelope when I was painting them just in case the paint bled through and stuck the two sides together, but it didn't happen. So yeah, just slap some paint on those suckers! (Or ink or crayon or whatever.) I originally considered painting both front and back of the envelopes, but then I thought about the black paint rubbing off on our nice white wall, so I only painted one side. 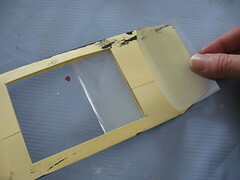 On the back (the unpainted side with the envelope flap), I measured an ATC-sized (2.5x 3.5") window in the center of the envelope. 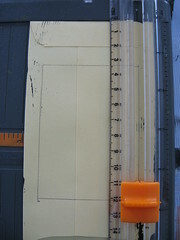 On this size envelope, it was 1-1/4" from top and bottom and roughly 3/8" from the sides. 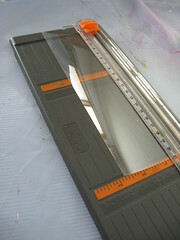 It doesn't have to be excessively precise. Note that I cut through both the front and the back of the envelope, creating an open frame (and two scrap pieces that can be used to make ATCs). 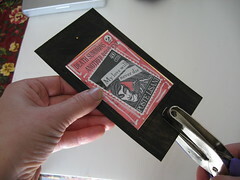 Be careful not to cut through the envelope flap. Once I folded my plastic strips in half, I slid them into the envelopes. Now conceivably you could just stop there and stick your ATCs in, but they'll probably slop around. 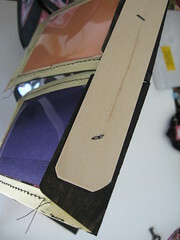 I considered double-stick tape as an option, but maneuvering sticky strips inside the envelopes was just too fiddly for me. 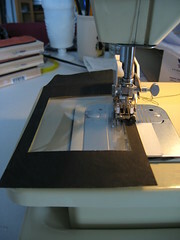 So my solution was to sew through all the layers of paper and plastic to hold the sleeve in place. Once all the envelopes were finished, I decided to attach them together with little black brads (from the scrapbook supply section of the craft store). I tried to punch my 1/8" holes consistently at the center of each top and bottom section (above and below the window) of each envelope, so they'd all be interchangeable and hang fairly evenly. 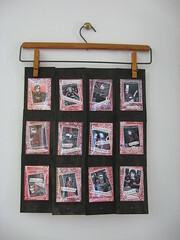 The display at the top of this blog entry shows everything hanging in portrait format, four columns & three rows, but they could be arranged in any way you wanted. I wanted to use this cool vintage wooden hanger that I had found at the thrift store, so I laid out my envelopes accordingly. I used one of those free paint stirrers from the hardware store as a support, drilling holes in it and attaching the top line of envelopes to it with more brads. Here's a few of the back of the envelopes (unpainted) with my yet-to-be labeled ATC backs showing though the "rear window." 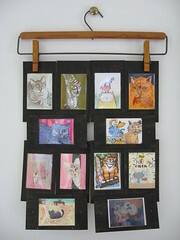 And below is the same set of envelopes as they're hanging in the living room now with some of my favorite cat ATCs collected from traders at ATCs For All and the Milwaukee ATC group. I punched holes in the long sides of the envelopes so they would match up with the holes in two of the short sides if two portrait-oriented envelopes were stacked above one landscape-oriented one. Make sense? Click to see this image with all the artists noted. Because I didn't attach the open side of the window to the envelope, I sometimes had trouble sliding my ATCs between the plastic layers because they'd pop out between the paper and the plastic layers. This can probably be fixed with a bit of that double-sided tape I didn't want to use. When changing out displays the little scrapbook brads can be fiddly (and poke under your finger nails *ouch*), but I'm probably only swapping my sets out every few months. 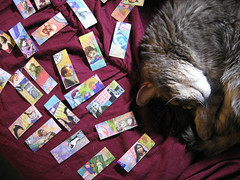 I wasn't very precise in my hole-punching so some of my envelopes hang cattywampus (no pun intended). I'd be interested to see other people's takes on this project! I realized that a sub-theme in my last post was documentaries by Asian-American/Asian-Canadian women, so I'll mention another documentary that I just watched in my usual short installments (DVR'd from Sundance Channel): The Grace Lee Project, in which filmmaker Grace Lee wonders why there are so many women with her name and goes in search of them. Similar to Are You Dave Gorman? in theme if not hilarity. So far I have not actually met anyone with my name, but I know there are plenty of them out there. 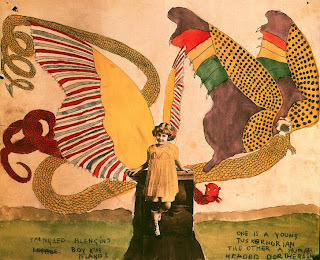 I will admit that I was unfamiliar with Henry Darger, though I am sure I had seen images of his work before I went to the Messages and Magic show at the Kohler Art Center last week. Then this weekend I saw Jessica Yu's fascinating documentary Protagonist on our digital cable's "free movies on demand" channel, and had to look her up on IMDb, where I found she had previously made a documentary about Darger, In the Realms of the Unreal. So now I'm waiting to get that DVD through interlibrary loan. 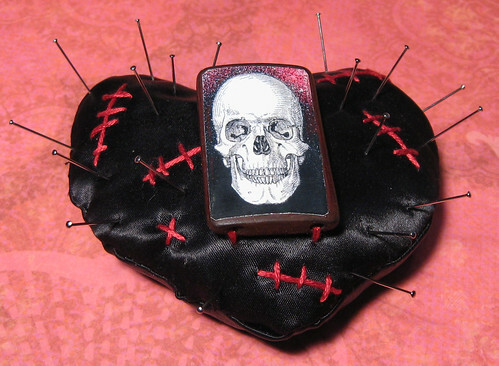 This pin-cushion in my entry in the Dabbled Black Heart Anti-Valentine Contest. 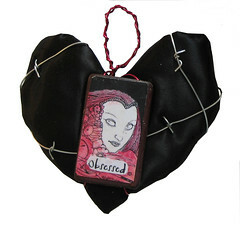 Oddly enough, I had already made it, along with 2 other black hearts below, for a Ten Two Studios Design Team challenge to make some quick and easy Valentine-ish projects. But as soon as I saw those Harry Clarke images from the Black & White domino sheet, all my anti-romantic tendencies kick in. Also the Milwaukee ATC group's February theme is "Black & White & Red All Over" so I have been thinking in that color scheme lately. My husband's comment on seeing these: "Should I be getting you psychiatric help?" I try to multi-task by crafting and catching up on TV shows, but once cold weather sets in, the grey cat Ruby thinks that I only sit on the couch for her convenience. No sooner do I settle in with my paper and scissors and glue stick (and old catalog to glue on and book or binder to use as a sturdy work surface and portable paper cutter and pens, pencils, ink pads) when she hops into my lap, spreading herself over whatever I happened to be working on and goes to sleep. And obviously if a cat has deigned to honor you with her presence, you can't disturb her, especially when she's so cute and fuzzy. So I try to have everything in reach, which inevitably means the ink pad or paint pen or tool that I need is in the other room. Also I end up with cat hair glued to my fingers (and Ruby probably has paper scraps stuck in her fur). 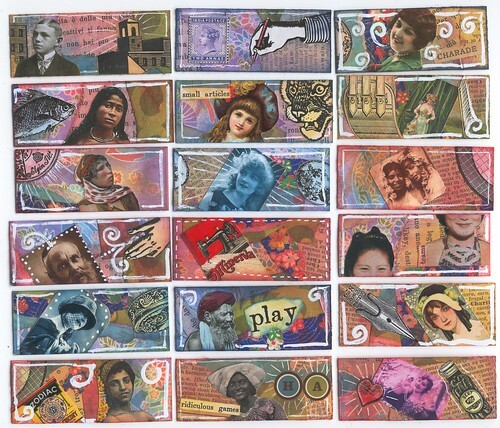 While working on ATCs for this Saturday's live trade, I caught up on last week's Battlestar Galactica so I could watch tonight's episode, plus new episodes of Burn Notice, That's Clever (finally saw segment featuring Ten Two Studios design team alum Diane Bouchard - yay! 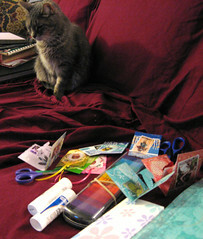 ), Bones, Quilting Arts and Big Love. I don't watch reality shows (other than Iron Chef America) because The Soup and Best Week Ever summarize everything I need to know. I've also been crafting lately while watching repeats of DIY's Jewelry Making and HBO's Generation Kill (talk about dissonance). The most important thing of course is to have the remote within reach so I don't ever have to disturb Ruby. Two posts in one day? Yikes! 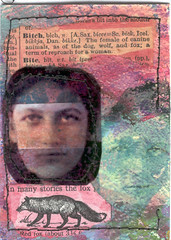 The January theme for the Milwaukee ATC group's live trade is "By Definition," and I was somewhat inspired by a book that Robin Kinney made for the exhibit "Serious Fun" at the Bay View Book Arts Gallery in which she contrasted photos of ordinary women with the epithets and insults commonly used against women. I went a little broader in my word choices but was still interested in how a different word can define the character of the anonymous woman depicted. Gary had given me these ink jet transparencies of vintage photos from his collection, apparently all the same woman with and without a hat. 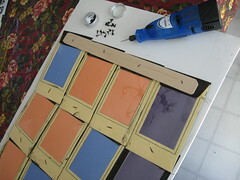 I used these to practice doing gel medium transfers on to ATC backs that I had painted earlier. Some transferred well - some not so much, but that's what gives them character! There was also enough image left on the transparencies that I could cut those faces up and sew them onto the ATCs as well. I also learned some new things, for instance that "chaud-medley" is the killing of a man (only a man?) 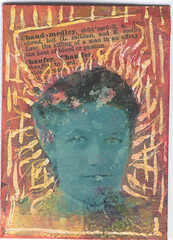 in the "heat of blood or passion." 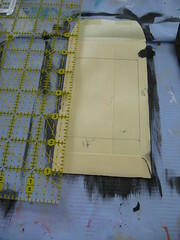 And the "seamy side" of things comes from sewing - the side on which the seams show. 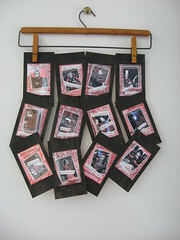 Full series can be seen here. Every once in awhile unrelated projects cross paths or intersect in some strange way. Over a week ago, I happened to be researching the family name Eytinge (no relation to me but it ties in with a history project I've had on the back burner for several years) and came across this print of actress Rose Eytinge on Flickr. 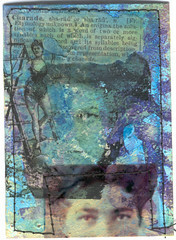 As soon as I saw it, I realized I had seen her before in the Ten Two Studios Vaudeville Women faux postage set. So this was tucked away in my brain when I saw that this week's Make It Mondays theme was Egypt. 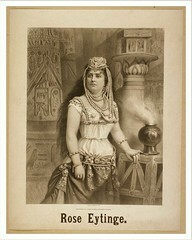 Rose was known for her portrayal of Cleopatra and had actually lived in Egypt for a time. I'm certain this print showed her in that role, given the hieroglyphics and Egyptian architecture in the background and the pseudo-Middle Eastern costume. 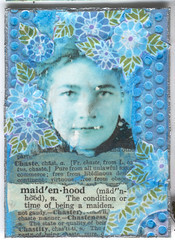 So Rose's faux postage stamp had to be the central image on my ATC. Because the theme for the Milwaukee ATC group's January meeting is "By Definition," I added a dictionary entry that applied to Cleopatra: "ambition." At Clip Art, ETC, I found the hieroglyphics for Cleo's name and some other Egyptian motifs for my background. 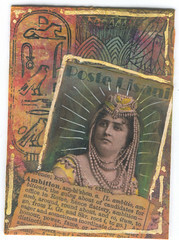 All these elements combined make my first ever Egyptian-themed ATC! Yesterday's high was below zero with windchills -30 to -40 degrees Fahrenheit, today's high was zero, so I was obviously fantasizing about spring when I made some of my samples for my Muskego classes in February and March. 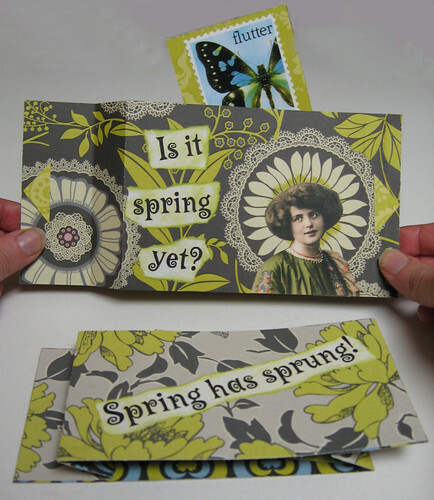 In February I'm teaching "Mini-Accordion Books" and in March "Easy Pop-Up Cards." 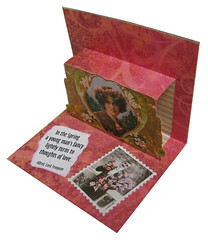 In the card sample above, when you pull the sides of the card, a butterfly pops out, using the colorful butterfly faux postage from Ten Two Studios. 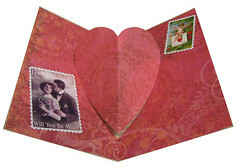 The paper is Amy Butler double-sided scrapbook paper and the dreamy flapper is from the Ten Two Studios green collage set. 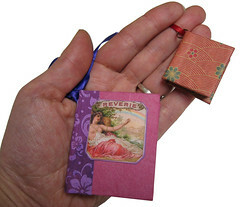 For the book class, I'm teaching a very basic accordion book like the one pictured above, as well as these little book ornaments or pendants (below), which were inspired by the mini-accordion book trade we did in the Mount Mary Book Arts Group last year and the "booklace" project featured in the September 2008 issue of the Monthly Muse. 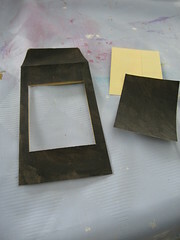 For the pop-up class I'm focusing on basic designs that anyone can do (I hope!). 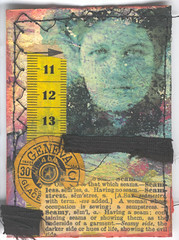 I decided to start 2009 by getting back into the Crafting 365 project, which I had been working on after I finished my ATC-a-Day project but fell out of the practice last summer when we started househunting and then moving. 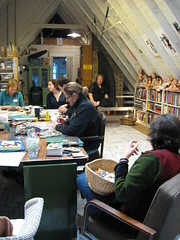 On New Year's Day, my friend Jess Poor held an art play date at her studio, so we all started the year craftily. 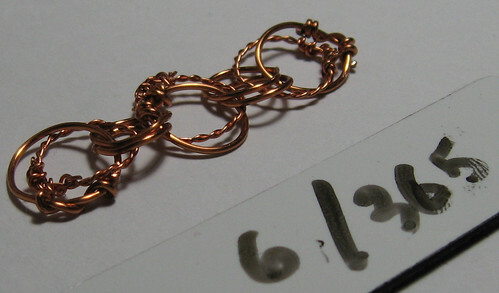 I wrestled with wire-wrapping techniques since I'm trying to improve my skills. My mom got me the book A Charming Exchange for Christmas, and I almost considered doing a "Charm-a-Day" project this year, but I quickly realized I was better off keeping my goals open-ended. 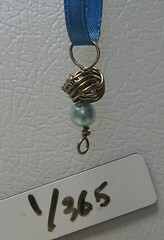 So my official photo for Day #1 (above left) was of the Coiled Wire Knot charm in that book. This was my second attempt since on my first attempt, I wrapped my wire around a larger dowel and the coils just flopped around when I joined them together. I also have Josie Cirincione's latest book Bent, Bound & Stitched, from which I got the instructions for the button pendant above (Day #2 - above right). I had a little trouble bending my wire to fit my button! Day 6 was another technique from Charming Exchange in which I learned I can twist wire with my little cordless Dremel rotary tool but I'm not very good at twisting it around itself. I want wire to behave like thread, but it seems to have a mind of its own. I'm getting better, but I do end up with a lot of distorted wire scraps (which of course I can't throw away, because I might be able to use them for SOMETHING). This week's Make It Monday's theme is Fresh Start, and this year I'm rebooting my Crafting 365 project. 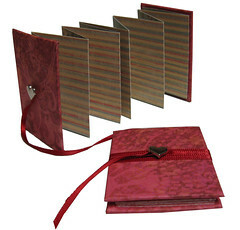 My goals for 2009 include trying new techniques and having a go at all those projects that I bought supplies for but never did! 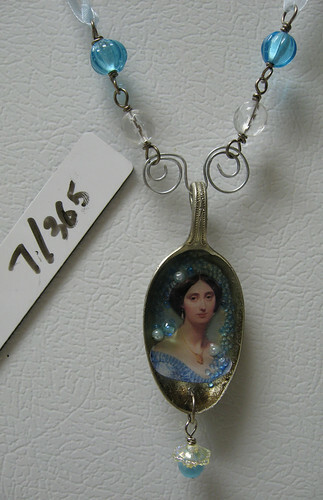 I had originally had more of an egg/bird's nest theme in mind because of the shape of the spoon, but then I decided to use the blue and white bead doodads that I had wire-wrapped on New Year's Day at Jess's art play date and from there I chose this lovely Ingres portrait from the Ten Two Studios Little Dickens collage sheet. 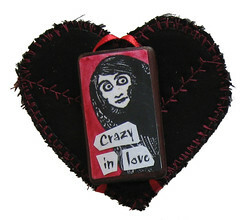 And so I made something new that I had never done before - hurrah!